With seven round trips daily – six on Sunday – Adams says the Hiawatha provides a good deal of flexibility for travelers, many of whom learn about the service through word of mouth. In fact, the service is proving almost too popular: many peak period runs are now standing room only, and there are budget requests in place in Wisconsin and Illinois to acquire more rail cars. Ridership surpassed 766,000 last year, including a record 63,000 in December. 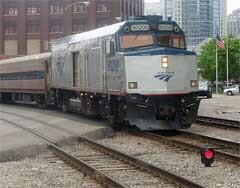 Adams says there are budget requests in place in Wisconsin and Illinois to acquire more rail cars.